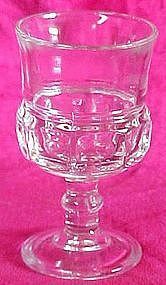 Indiana or Tiffin, Kings Crown clear cordial 3 5/8"
Older Tiffin or Indiana glass wine cordials in the Kings crown pattern. Measures 3 5/8" tall, and in excellent condition. some have the old bubbles inside the glass. I have 4 available and price is for each.